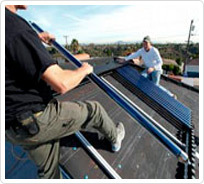 This contractor and self-installer workshop is a prerequisite for participation in the CSI-Thermal incentive program for solar water heating installations. For contractors, it is MANDATORY that the contractor business owner attend the workshop, and it is strongly recommended that the lead installer and rebate manager attend as well. Contractors must hold an A, B, C-4, C-36, or C-46 license in order to be eligible for this program, and the attendee's name must be identified under the contractor's business name on the California State License Board webpage. This workshop will provide information on the CSI-Thermal Program requirements, such as the application process, incentive amounts, customer and equipment eligibility, and installation guidelines. Training on solar water heating system design and installation is not provided in this workshop. Lunch will be provided for this event.